Job growth slowed dramatically in March. Hiring slowed sharply in March, with the economy adding only 88,000 jobs, the lowest monthly gain since last June. 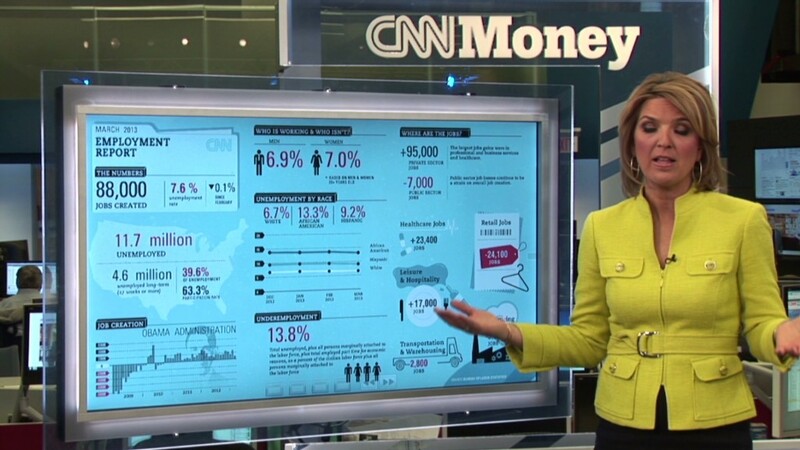 Economists surveyed by CNNMoney were expecting an increase of 190,000 jobs. The unemployment rate slipped to 7.6%, according to a Labor Department report released Friday. Experts had expected the jobless rate to remain at 7.7%. But the decline is not good news: It's because nearly 500,000 people dropped out of the labor market. No need to panic. Still, the report left economists cautioning not to read too much into one month's numbers. While the dour news was unexpected and has tempered some economists' views on the labor market's health, many still expect hiring to continue at a steady clip for the rest of the year. "Payrolls can be very volatile from month to month," said Jim O'Sullivan, chief U.S. economist at High Frequency Economics, who thinks monthly jobs figures will average around 175,000 for the rest of the year. "I'm not inclined to panic over one 88,000 number." Looking at the first quarter, companies expanded payrolls by 168,000 a month, on average, roughly in line with the trend over the past two years. That reflects one of the bright notes in Friday's report: Hiring in January and February was revised upward by 61,000 jobs. Economists surveyed by CNNMoney earlier this week were forecasting that employers will add 2.24 million jobs over the course of 2013, and that 2.4 million jobs will be added next year. They also think the unemployment rate will edge down slightly to 7.4% by the end of this year and improve to 6.7% by the end of 2014. That would put it close to the 6.5% level that the Federal Reserve has said it wants to see before considering raising interest rates. Another spring slump? Experts offered a variety of explanations for the March slowdown, which some fear could be the beginning of another "spring swoon." Some companies may have increased hiring in January and February, hoping for a stronger economic rebound in 2013, but then pulled back in March when sales didn't match expectations, said John Silvia, chief economist at Wells Fargo. "The slower hiring will certainly make people less optimistic about economic growth going forward," said Silvia, who also attributed part of the slowdown to seasonal factors that have dampened job growth each spring since the Great Recession. While the impact of the forced federal budget cuts, which began March 1, was a concern, it doesn't appear to have directly affected the March payroll figures much. The federal government, excluding the U.S. Postal Service, shed only 2,200 positions. But the cuts are weighing on businesses, said Scot Melland, chief executive of Dice Holdings, a global online recruiter. "They are still being very cautious about adding workers," he said. "They are still uncomfortable about the future." 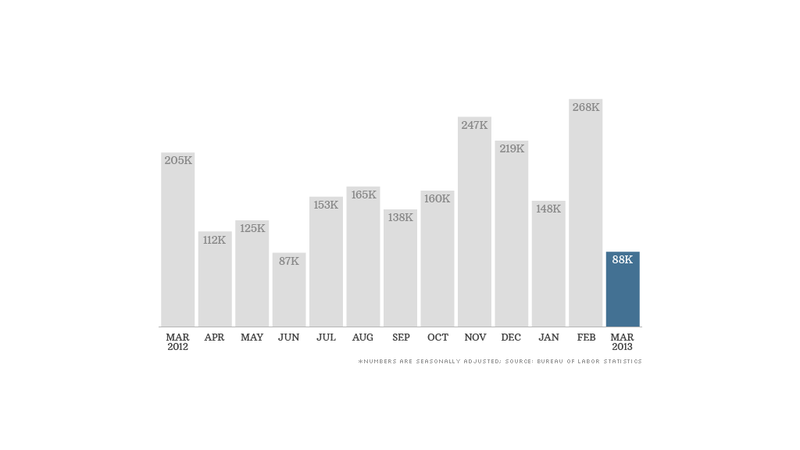 Another worrisome issue is the nearly half-million people who left the labor force last month. That continues a trend of recent years, said Patrick O'Keefe, director of economic research at CohnReznick, an accounting, tax, and advisory firm. The labor force participation rate, which measures how many people are employed or looking for jobs, fell to 63.3% -- its lowest level since May 1979. He added that if these people are departing the labor force because they have given up looking or aren't even entering the workforce because they are too discouraged, that will weigh on consumer confidence and spending. Retail lags but construction still hot. Last month, hiring was concentrated in fewer industries. Growth was dragged down by the retail sector, which lost 24,000 jobs, and at the U.S. Postal Service, which shed 12,000 positions. The drop in retail was particularly disappointing, considering that the sector had averaged an increase of 32,000 jobs a month for the past six months. Overall, the private sector added merely 95,000 jobs, while the public sector lost 7,000 jobs. The lousy monthly jobs data concluded a week of downbeat labor market news. A report Thursday showed that initial unemployment claims jumped 28,000 for the week ending March 30. On Wednesday, ADP said that private sector hiring had slowed in March. Investors did not like the report either. Stocks fell Friday on the news.